My old wok has sprung a hole, after 10 years of servitude. I hunted for a new cast iron wok everywhere but could not find a thin one (like my old wok), which would be easy to handle and heat up quickly. Love my new wok: big with deep sloping sides and only costs RM27 (US$8). 1. Use paper towels to wipe away the protective oil. 2. Wash and scrub the wok with steel wool, inside and out. Wipe it dry. 3. Put it on the stove, heat it till it begins to smoke and pour in, say, 1 cup of veg oil. 4. Add white tofu (I used 8 pieces since my wok is big) and garlic chives and fry for about 20 to 30 minutes. 5. 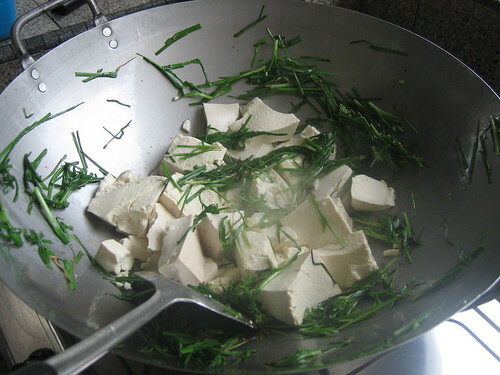 Throw away the tofu and chives, wash the wok without soap and wipe it dry. Smear some oil all over. It's seasoned and ready to be used. Verdict: I still detected industrial oil in the first dish I cooked with the new wok although nobody else in the family did. Typical. Of them. After 2 more times, the wok worked fine. It is good to deep-fry the first couple of times so the oil will really seal the surface of the wok. The more you use the wok, the deeper the color will go, until it develops a shiny black patina and a permanent non-stick surface develops. I have yet to buy a bunch of bamboo skewers to wash the wok with. Apparently you should use the bamboo/lidi brush (they do that in the restaurants) and never use washing detergent which will cut too deeply into the surface of the wok and take away all the oil, making the wok vulnerable to rust. Unless it is super dirty, just wash with water and a brush. HI! Is it better to cook in wok like this? I know in restaurant they have those black cast iron ones. I have one mum got for me it has this nano technology thingy whick looks like just plain carbon steel and you dont need much oil and washing minimal as it does not recommend detergent. Aunty linda told me about cast iron ones but i had not fully understand the benefits of it. this wok will turn black in time like d restaurants'. i have a stainless steel wok which i don't like bc it'll never develop a on-stick oil coating like a cast iron or carbon steel wok n it burns my food too. welcome dear. i'm learning too. You should season the wok until it's totally black. Get it as hot as you can and spread a thin layer of oil on with a paper towel and keep heating until it's burned away. There's loads of smoke. Repeat until the wok's all black. Hi Terri, Can you please tell me what is the name of the shop in Karamunsing that sells this type of carbon steel wok? Am interested to get one too. Many thanks for your tips. Does it give you the kind of 'wok hei' as in the traditional chinese cast iron woks? and yes, it gives 'wok hei' bc the metal is thin n heats up n cools down very quickly. anony: just saw ur comment; thanks for the tip! That's interesting. I've never heard of seasoning a wok that way. I tried seasoning mine by covering it with coconut oil and baking it at 205 degrees Celsius for an hour and a half, but it's still not black (my apartment smelled good, like movie theatre popcorn, though). Hi, I never knew about the mechanical oil so I cooked (yesterday) but I never got greasy or dirty when touching it :S I live in Norway and sometimes things are a bit back to front here (you will NOT find ANY tofu here I can promise you that:C ) and after freaking out and before knowing what (not) to do I washed mine like 3 times with boiling water and dish washing liquid. And now it's rusting >_< !! I only have margarine, no vegetarian oil or any kind of oil. I don't know what to do, my boyfriend recommends to take it back to the store but I have no clue what to say :S "Hi, I was a bit stupid and ruined this pan". prettylitlpixie: not sure what oil they use (china being china) but i don't like the taste. u can get a wok in norway but not tofu?? i think basically the tofu was used to 'inaugurate' the wok. next time you get a new wok, choose smthing absorbent n cheap to cook, then throw it away. btw, my wok is now beautifully black-bronzed n food doesn't stick at all. i LOVe it. Hi, I was given an old Chinese wok which has already been seasoned. The problem with this wok is each time I wipe it with oil (after heating it and before putting it away) the paper towel will turn brown and have black specks on it. If I wash the wok with soap, the paper won't be so brown but the black specks will still be there. Some people say to keep using the wok and the black specks will go away but they don't. I think the black specks could be carbon and thus harmful if ingested. Would you have a solution to this problem? Thanks! My sis bought a wok online and it smells really bad. I tried to season it by putting it on the burner and adding oil but the smell just got worst. Is the industrial oil you're talking about suppose to smell this bad? Did your wok smell like some kind of toxic chemical like hers? anon: yes, my wok had thick industrail oil tt smelt bad but i wiped it off, washed in dishwashing liquid n seasoned it like in my post. the first couple of times i detected slight smell in my fried fish (the first few times, cook only oily dishes, it's another way to season the wok) altho my family didn't. but it went off pretty quick. I clean my wok by pouring salt into it and scrubbing dry with a paper towel. That loosens the food bits. Then you dump out the salt, rinse and heat dry. For seasoning, I scrubbed the wok clean with soap and water, dried it, and then filled the wok with a thick (say, half-inch) layer of salt and heated for 30-45 minutes on the stove. After the wok was blackened, I tossed the salt, let the wok cool, and then coated with oil and heated it to smoking once. Done, and without too much smell. Hey Drunken Pig Boxer - Thank you so much!!! I've had my wok for more than 20 years and it always had a metal smell which transferred to my food. I apparently never seasoned it properly. Prior to reading your post I had washed, dried it and coated with a small amount of vegetable oil. So when I coated with salt (I used kosher) it stuck really well. I used only probably 1/8 inch, and heated for about 15 minutes. The metal turned dark pretty quickly and the smell began to go away. I let it cool then rubbed all the salt out with a paper towel, added more vegetable oil to coat along with a clove of garlic (I wanted to be sure the smell went away)burned the oil in for only about 5 minutes. Let cool, then rubbed out the oil with more salt and a paper towel. I've learned my lesson - will never use soap and water again. I'll clean it out with salt as the abrasive and a paper towel, re-oil and store. Thanks again! !